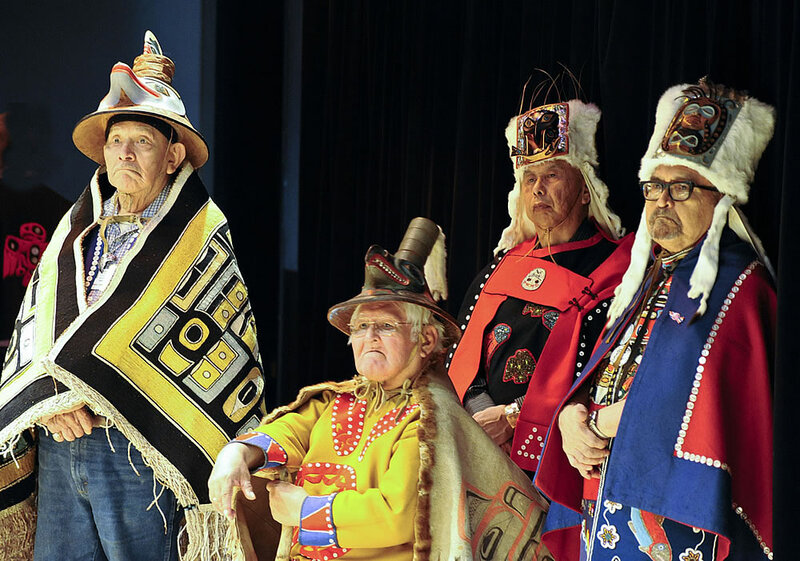 Photo above is from 2012 conference in Sitka: left to right, Chatskookoo Éesh (John Nielsen), Chookaneidí, Iceberg House; Ł’eiwtu.éesh (Herman Davis), L’ooknaxh.ádi, Platform House; Yéił xhaagú (John Hanlon), L’ooknaxh.ádi, Frog House; and Khaa.ítdei du.áxhch (Ed Kunz), L’ooknaxh.ádi, Outwards House. Dates are set for the next Sharing Our Knowledge conference (aka “Clan Conference”): Juneau, Alaska, September 25 through 29 of 2019. We intend to make use of the “Willoughby Campus,” which includes the Elizabeth Peratrovich Hall, the Juneau Arts & Culture Center (JACC), and the new State Libraries and Museums (SLAM) facility. We are also planning a collaboration with the University of Alaska Southeast by organizing a field trip that will include an orientation on the UAS campus prior to visiting important sites associated with the Auk Kwáan. The most recent Sharing Our Knowledge conference was held October 13-17, 2017, at the Sitka Fine Arts Campus (formerly Sheldon Jackson School). Sitka conference theme: Haa Shagóon, Yei Sh Natoosneix (Our History, We are Healing Ourselves). Conference Outline: Evening of October 13, Welcome event, “Warming Our Hands,” 6 pm, Odess Hall; October 14-16, all day talks and evening sessions; and October 17, Wrap up brunch. Summary: Special events included a Kiks.adí welcoming ceremony on Saturday evening, October 14; a Monday afternoon Kiks.adí ceremony at the base of Noo Tlein (aka, “Castle Hill”); and throughout the conference presentations by representatives of the Smithsonian Institution demonstrating 3-D scanning and how such scans are translated into plastic and wood, and an outdoor demonstration of the use of the atlatl, the spear-throwing device. Other special events at the October conference included an on-going weaving workshop complimented by a retrospective (by Aldona Joniatis) on the work of Clarissa Rizal and Teri Rofkar, both of whom were the subjects of a beautiful documentary, “Lineage: Tlingit Art Across Generations,” produced by Scott Burton and Ishmael Hope, that was screened at the conference on Monday afternoon, October 16. The conference concluded on the morning of Tuesday, October 17, with a “wrap-up” brunch. About the Conference: This unique biennial event is open to anyone with an interest in the indigenous peoples of Southeast Alaska and their Canadian relatives. Since the first Sharing Our Knowledge conference at Haines/Klukwan in 1993, this three- to four-day symposium has brought together Alaska Native and First Nations tradition bearers, elders, and fluent speakers of indigenous languages with artists, academics, researchers, students and other learners. Subjects presented include linguistics, archaeology, art and music, Alaska Native history, museum studies, cultural anthropology, indigenous law and clan protocols, fisheries, traditional ecological knowledge, and others. The conference format includes morning plenary sessions followed by concurrent workshops in the afternoons. Evenings are devoted to cultural activities that include a Warming of the Hands (welcoming by host Clans) on the evening immediately prior to the conference, with other evenings available for Raven and Eagle/Wolf ceremonies, poetry readings, and other creative presentations. Weavers of Chilkat and Raven’s Tail blankets and other artisans gather to work on and present their creations throughout the conference. Alaska Native art sales are also presented.